Modern gadgets and tech can help make camping easier. We’re not talking about mobile phones or tablets that can ease boredom away for some people. 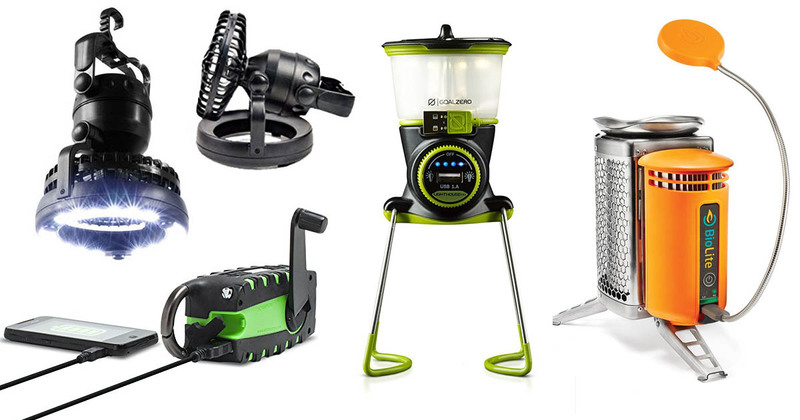 We’re talking about gadgets that can make living outdoors for a short period of time more streamlined when you’re without the usual conveniences of modern living. Here are some suggestions you may want to pack along with you when you’re roughing it out in the great outdoors. When space is limited it is nice to have a tool that performs multiple tasks, and the Eton Scorpion does that well. It is a solar-powered and hand-crank capable AM, FM and NOAA weather band digital radio. Aside from this, it also has a LED flashlight and can act as a charger for your phone or gadgets. It can be clipped onto your backpack with a carabineer. Oh, and the clip also acts like a bottle opener. The Biolite Campstove is revolutionizing the way campers cook food. Instead of fuel like butane, it uses pine cones, twigs and other biomass you can find on the trail making it a cleaner and lighter way to cook food. No need to carry solar chargers or power banks because the campstove’s heat that is generated when cooking can be converted to energy to use for charging your smartphone. The Rugged Rukus water resistant speaker from Eton has a high efficiency mono crystalline solar panel that powers the speaker, and charges your phone or MP3 player. The Rugged Rukus has bluetooth capability and an audio jack in case you want to play music from a non blue tooth device. The sound this speaker produces is truly impressive especially considering it usually sells for under $65. On warm summer evenings in the campsite this great product from Image is one of the best tent accessories you can buy. The built in hook is really convenient for hanging from the ceiling or side pocket of a tent. Whoever designed this fan must have run into the problem of lighting and cooling a tent, because it is very versatile. It can be folded to sit on the floor or another surface, and both the fan and the light can be turned in different directions. On the high setting the batteries will last 15 to 20 hours depending on what type of batteries you use. It feel pretty rugged and durable and it usually sells for under $20 which is a small price to pay for the comfort and convenience it provides. This ingenious mini lantern from Goal Zero doubles as USB power hub, so you can recharge your mobile devices. The lantern itself can be charged vis USB, built in hand crank or by the Nomad Plus portable solar panel that is sold separately. One of the most convenient features of this mini lantern is that half the light can be shut off to save power if you do not need 360 degree lighting. It also has selectable power settings, so you can turn the light down pretty low to save battery power.